A concert benefiting the Farley Foundation will take place Dec. 17 in Hamilton, Ont. Organized by well-known local singer-songwriter Martin Verrall, the matinee event will feature 21 musical acts, plus pet photos with Santa. Verrall learned about the Farley Foundation from his veterinarian during regular visits with his cat, Vlad. When Vlad passed away earlier this year, Verrall wanted to do something in his memory and give back. Since its establishment in 2001 by the Ontario Veterinary Medical Association, the Farley Foundation has disbursed $3.4 million to assist more than 8,000 pets in need. It subsidizes up to 100 per cent of the cost of care to a maximum $1,000 per pet or pet owner per year for vital treatments, including diagnostics, surgery, hospitalization and medications. Pet owners demonstrating financial need can apply for funding through their veterinarian. 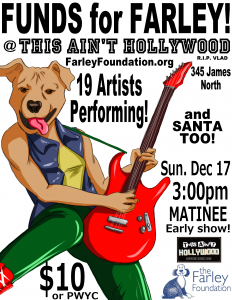 The Funds for Farley benefit concert takes place Dec. 17 at This Ain’t Hollywood (345 James St., N.) in Hamilton. Santa photos are at 3 p.m. and the concert starts at 3:30 p.m. Admission is $10 or pay what you can.